Escape the chaos and monotony of a hectic lifestyle with pagoda, space within which peace and harmony unite to dissolve your worries. Reunite with your lost self and transgress from the ordinary in the cubicle of bliss. Health Culture brings to you, a one of its kind experience with the Pagoda. While cubicles remind you of the struggles and stresses of your mundane lifestyle, at Health Culture, we’re breaking this myth. An experience of 19 minutes that unifies the benefits of 9 therapies, to completely revitalize your mind, body and soul connection. The Pagoda meditation boosts oxygen intake of the system due to the concentrated nature of oxygen in the cubicle. Constant exposure to the polluted environment, extreme temperatures and high stress inducing activities, leads to faster aging and loss of elasticity of skin. The production of collagen is boosted, retaining and improving the natural suppleness and elasticity of the skin. The combination of the best of meditative techniques ensures complete stress relief in the Pagoda meditation. The psychological effects of stress are unavoidable due to a strenuous routine and fast paced living. 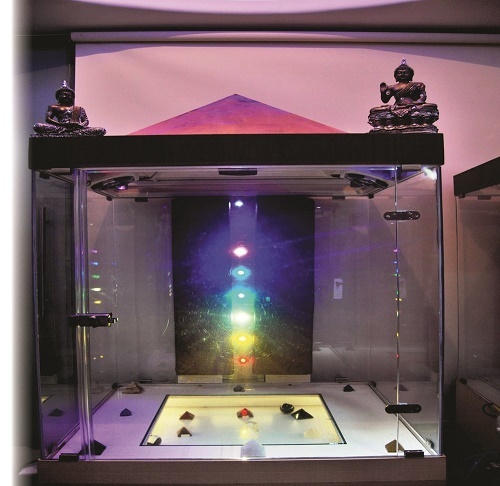 The Pagoda induces a meditative state and chakra healing, helping balance hormonal disorders, greatly reducing stress and recovering from depression and anxiety. The Pagoda meditation accelerates healing not only within the system but also extrinsically. A mundane or athletic lifestyle leads to a lot of physical exhaustion, that surfaces as the pain of the physical body. The Pagoda helps reduce rapid degeneration of bones pain by inducing relaxation. The endocrinal system is benefitted by the Pagoda meditation that can help control diseases like diabetes and hypertension. Step 1: Arrive into the pagoda room. Step 2: You will be guided to get into the pagoda chamber. Step 3: You will be given instructions via a headphone inside the pagoda. Step 4: You can then begin to meditate, with slow music in the background. Step 5: This session will last for 19 minutes during which you can experience 9 unique therapies.